In an age where photos and videos rule all our travel stories, Yawo is carving itself a niche by allowing you to record a 60-second voice note about the places you have checked in to. The name Yawo is derived from a South African language that translates to wander. Quite aptly named we say, for an app that’s basically designed for wanderers. Instead of the usual Facebook check-in or an Instagram post, the Yawo concept is ‘recorded stories’. All you got to do is record a 60-second voice note about your experience of a particular place such as what you like, what you didn’t, must try, and more, and tag it to the said location on the map. Now, what about the voice note you tagged to the location? Well, it acts as a guide, a tip, or a recommendation, for the next person who happens to be at that place. All they have to do is press the play button and they can listen to your voice note about the place. The app uses Google Maps, so all major locations are automatically available. All you got to do is just tag your voice note to the location you wish to talk about. 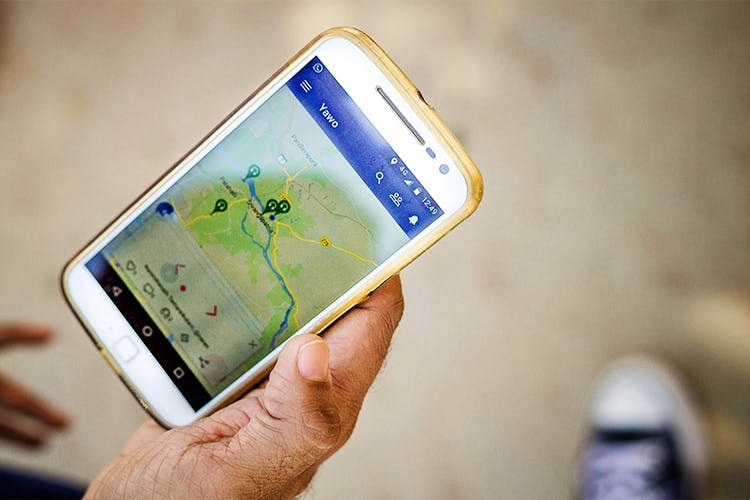 On a recent invite from the founder, Manish Agarwal, and Monika Manchanda, a food consultant and writer, we checked out the app on a curated road trip from Bangalore to Mysore. While we are yet to leave stories at the places we stopped at such as the Government Cocoon Market, Jai Bhuvneshwari Military hotel who we think has rather good pepper mutton chops, and Earth Loaf Chocolate Factory, you can listen to the stories left behind by Manish and Monika when you download the app. Oh, and we even passed by the famous Ramnagara rocks where Sholay was filmed, and there’s a rather charming story by Manish that you must listen to. A morning breakfast pitstop of ours, Guru Hotel, has Monika gushing about the fluffy thatte idlis. In terms of using the app, we found the concept quite interesting and the app easy to use. A few improvements that we suggested notwithstanding, the features such as dated stories, stories that pop up during the navigation mode, and the search options all make the app a winner with us. You can even share your stories on social media. For now, you can start your storytelling by downloading the app here. The writer was invited for the experience by Yawo.